Through JazzCash Bank Deposit service you can now send money instantly to your friends, family and business partners directly into their Bank Account in the most efficient, secure and convenient way. 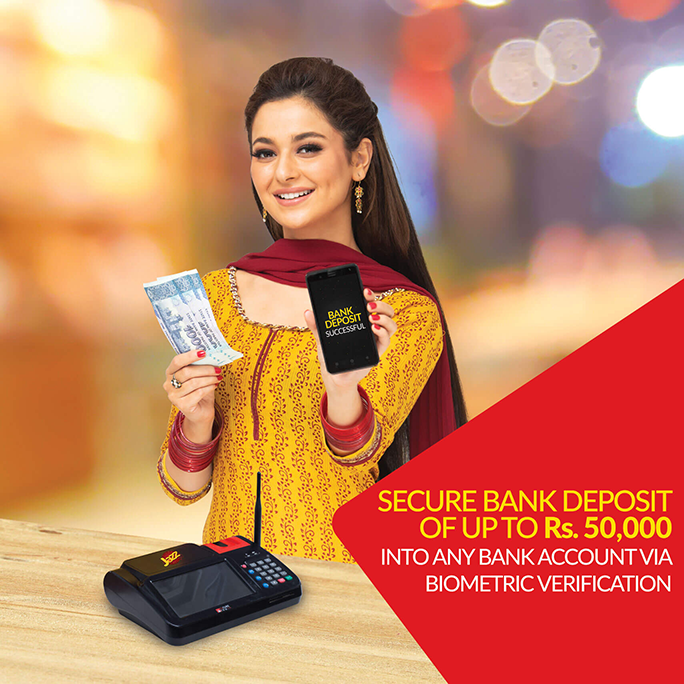 Now Bank Deposit service is also available with biometric verification enabling customers to send up to Rs. 50,000 to any 1-Link connected bank account instantly. Any JazzCash Mobile Account holder or any person with a valid NADRA CNIC can avail this service. Payment can be made into any Bank connected to the 1-Link network. Instant transfer of funds through a seamless process. An instant SMS message will be sent to both the Sender and the Receiver on successful transaction. This service is not limited to Jazz subscribers other mobile network subscribers can also use this service through our agents. Expired CNIC will not be entertained for performing any transaction. Multiple transactions on a single CNIC can be performed in a month. There is no limit to how much money can be received by a single Bank Account through this service.